Upon watching the first stage of this year's Tour de France, I found myself glued to the screen, again becoming familiar with all there is to see in any one stage. To me the race is never one that whizzes by - not when there is so much to look at. Special jerseys, helmets, numbers, bikes, motos, and oh the marvelous scenery. As wonderful as the atmosphere appears on TV, it is incredible to be there at the Tour in person. The sounds, the people, the towns, and the rush of excitement as the caravan, riders and team cars pass by - the Tour de France is simply fabulous. What is up with the yellow helmets? 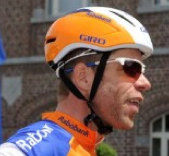 This year the Tour organizers have asked the teams to bring extra yellow helmets just in case the team is in the lead for the team classification. That is correct, the order went out to all teams to pack an extra 9 yellow helmets. Team Sky got to wear their inventory of yellow helmets on day one, designating the team as leading in the team classification. People either like or hate the visual that the new yellow helmets create in the peloton. I like the concept since the other classifications have special jerseys and I tend to overlook which team is in the lead, but I'm not sure about over-using the color yellow. Sure new helmets are a low-cost easy solution to highlight the team, and give more exposure to team helmet sponsors, but they diminish the tradition of the maillot jaune helmet. Update: If you are wondering what that helmet cover on Mark Cavendish's helmet during Stage 2 (not stage 1) was all about - Cavendish believes the cover to be more aero. He wore a helmet cover when he won his world championship title last year. I am impressed that Team Sky thought to bring the yellow cover with them, but maybe they had big hopes of someone being in the yellow jersey. Probably more likely than wishing the entire team would be in yellow helmets. Which reminds me, how long will this new yellow helmet rule be in place. Is this a trial rule, or a rule that is here to stay? Yes even road helmets are turning aero; read about the development of the new Air Attack helmet by Giro and Tour de France teams go aero for Monday's expected bunch sprint, by CyclingWeekly. CyclingWeekly reported that Team Sky, Rabobank, Lott-Belisol, and Garmin-Sharp were a few of the teams using differing forms of aero covers, ventless helmets or the new Air Attack aero helmets. The new Giro helmets are said to be available to consumers next spring, for around $200. Another unique helmet is worn by Sammy Sanchez, who wears a gold helmet (not yellow, but glistening gold, with Olympic rings) marking him as the current Olympic gold medalist in road cycling. Sanchez also wears gold shoes. In addition to the classification jerseys (yellow, green, polka-dot, white) and the team jerseys, you will notice a few other unique jerseys. 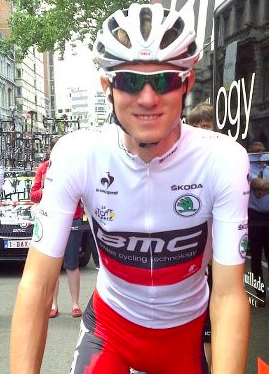 When racing a road stage the current World and National Champions will wear their country jerseys. When racing the time trial, the current time trial champions will wear their national skinsuits. Who are the world and national champions in the 2012 Tour de France? There are plenty of colored armbands in the peloton, these mark the former national and world champions. What an honor it must be to wear ones country colors on a jersey sleeve or collar for the remainder of a career. You will notice the RadioShack Nissan Trek team wearing the yellow Livestrong cancer awareness armband on their left sleeve. Yellow in color, the band has nothing to do with the Tour de France. Note that all apparel and logo advertisement on jerseys must be pre-approved by race organizers - that was the reason for the delay and subsequent fine to the RadioShack team on the last stage in 2010 when the team changed jerseys to honor cancer patients. Noble, but not allowed. The classification jerseys for 2012 Tour de France are no longer made by Nike, the yellow, green, polka-dot and white jerseys are now manufactured by Le Coq Sportif (read more Tour de France Jerseys by velopeloton). A few teams presented with new jerseys for the Tour de France. Garmin-Sharp and SaxoBank-Tinkoff both have new sponsors and thus new jerseys. 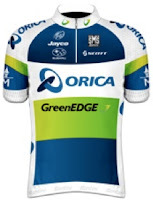 Team Orica-GreenEDGE updated their jerseys to better reflect sponsor colors. 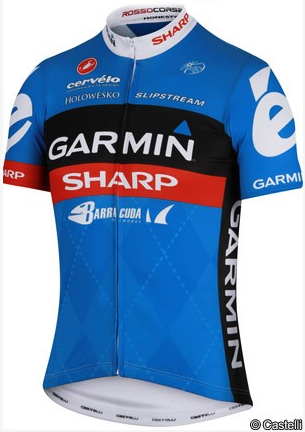 Other team jerseys can be seen here: 2012 ProTour Team Jerseys by Pedal Dancer. Fans can also garner more information by reviewing a rider's number. Yellow background denotes the current team classification leaders (the entire team wears numbers on a yellow background). Red background is worn by the rider awarded the most aggressive title from the previous day's stage. Dossard #13 is often worn upside down to ward off superstition. 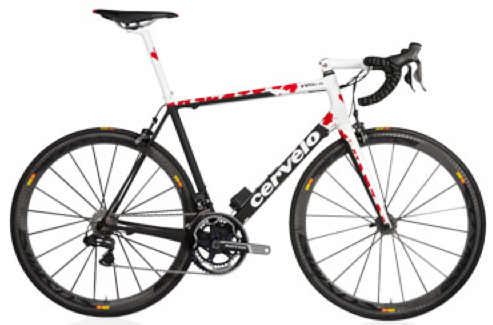 Number one, of course, is worn by last year's winner Cadel Evans. The composition of the dossard number describes both the team number and the rider number - please read more about dossards at this very popular Pedal Dancer post Word of the Day: Dossard (you might learn something new). 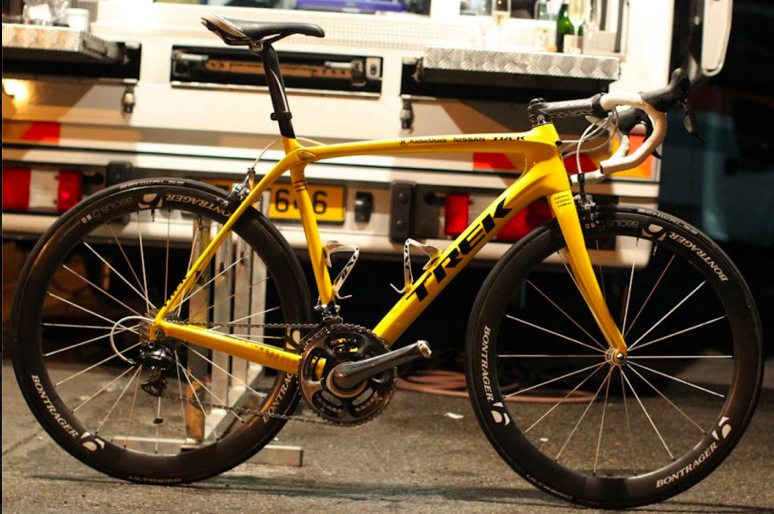 George Hincapie's new bike for the 2012 Tour de France has special graphics. 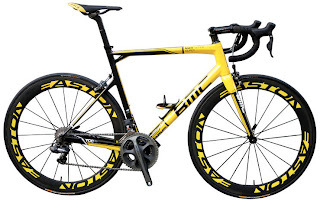 Cadel Evans also rides his yellow and black BMC bike. Consumers can buy 1 of only 141 of these special SLR01 frames made by BMC. 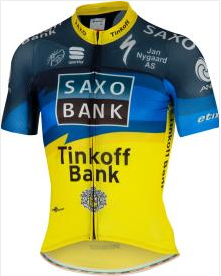 Again, there is almost too much yellow in the peloton this year. 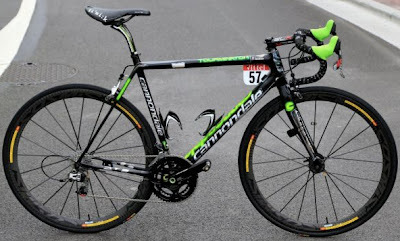 Peter Sagan has a new Cannondale EVO Supersix bike for the Tour de France called the "Tourminator"
Today we were in Belgium, riding through the Ardennes, a green hilly region well known for it's historic battles. The helicopter views looked like a movie set, although I am aware that most towns would probably not want their town thought of as a war movie-set. 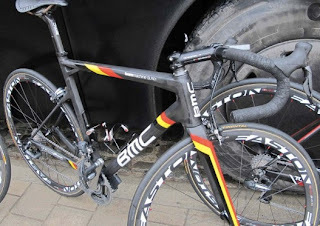 I became a big fan of Belgium after my last visit in April for the Tour of Flanders and Paris-Roubaix. Although I am returning this year to the Alps, Provence, and Pyrenees of France, next time I go back, I want to see much more of north-western France and Belgium. I was very interested in the mix of history and land. 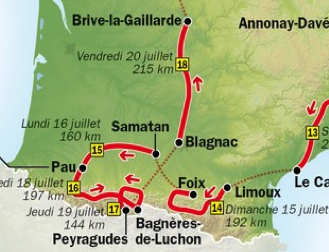 Where are we going this year in the Tour de France? As we all know, many, dare we say most, fans tune in to watch the scenery. 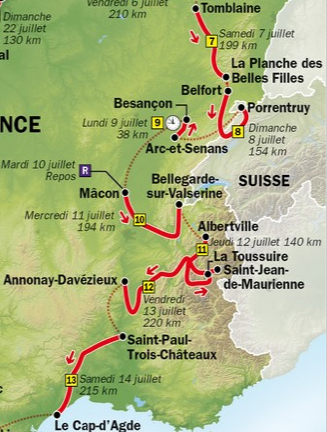 In the course of 3-weeks we will see large cities, small towns, mountains, cobbles, castles, sea and vineyards. This first week we will spend a chunk of time in the north. Next week we will do a quick fly over in the Alps, a day in Switzerland, followed by more time in the Rhone River Valley (yeah vineyards!). 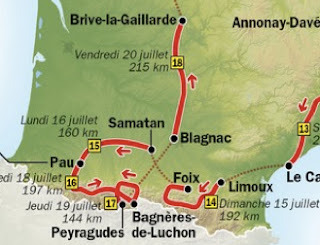 The final week we spend time in the south of France in the mighty Pyrenees, with a final time trial just outside the city of Paris before the final ceremonial procession into the grand city on July 22nd. Between the current Olympic trials, Tour de France, and the Olympics in London - this summer we have a lot of fun to look forward to. I leave Colorado on July 9th ... in route to Lyon. France here I come!